Join And Get Instant Access to 1 Hour Apps For ONLY $497! Skype Coaching Group Call: You'll get to Join a 90 Minute Group Coaching Call with Colin, he will help you understand exactly how to fast track your earnings in Mobile Apps and start making money in your first thirty days. - For The Next 25 Sign-ups!. 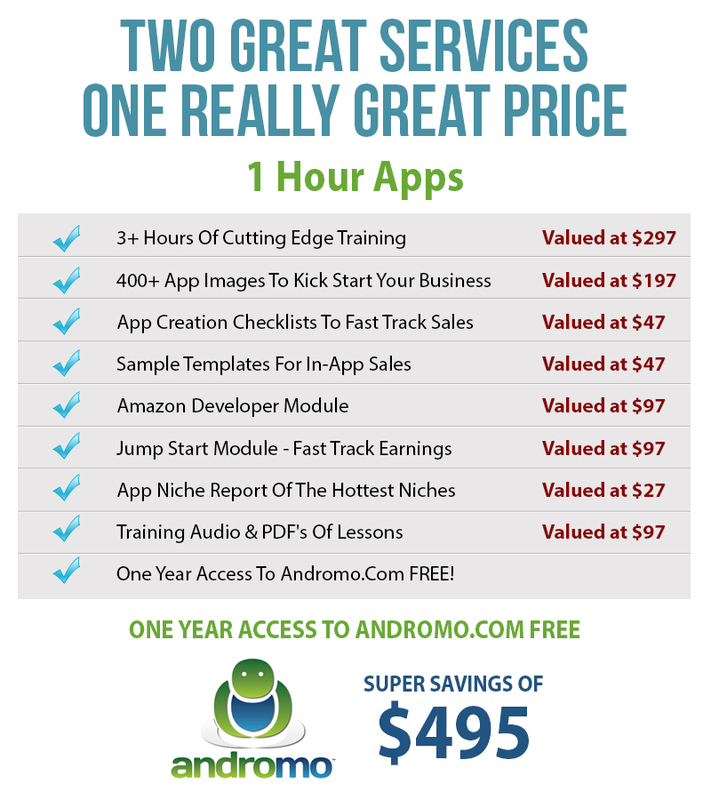 Andromo Professional Plan FREE! for One Year: Get the Andromo Professional Plan absolutely free for one year. Create Apps without any restrictions and priority queuing for build jobs. 4-Hour Outsourcing: Complete download of the 4 Hour Outsourcing Guide by Matt Rhodes. 5 Modules of training videos on how to build your own outsourcing army of virtual assistants complete with How To's and even job posting templates. Gaming Module - Create Gaming Apps: Learn how to create Gaming Apps using Andromo. This exclusive training will teach you how to build gaming Apps in under 45 minutes. Access To The Review Community: You need reviews to help with sales for Apps. While your App is Free on any store we send out an email weekly to community members to post an honest & positive review - helping to drive sales. Amazon App Secrets Module: A special training module in the members area showing you exactly how to have Amazon provide you with over 500,000 Free Add Impressions and How To Offer Promo Sales that will catapult your App Sales. 30-DAY MONEY BACK GUARANTEE: You can test drive the entire 1 Hour Apps Training System for a full month before making a final decision. If you are not thrilled with the information and tools provided… for any reason at all… simply let us know and you get all your money back. I'm ready to start making money with Mobile Apps!